Rufus Hound is an English comedian, actor and presenter. Former Science Museum guide turned stand-up comedian whose big break into show business was reaching the final of the Channel 4-sponsored So You Think You're Funny? competition at the 2002 Edinburgh Festival. He makes regular radio appearances on LBC and BBC London. 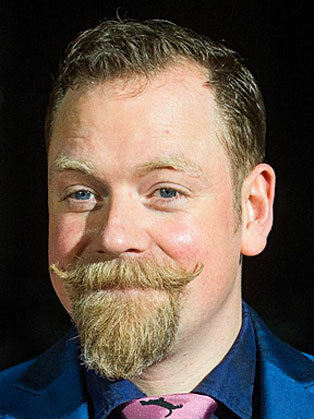 Comedian, presenter and actor Rufus Hound has appeared in acclaimed West End productions, films, panel shows, children’s television and dancing contests. Combining an affable, laid-back delivery with irreverent, cheeky humour, he’s a natural live host and a popular performer. As a presenter, Rufus started out fronting Top of the Pops and coverage of the Glastonbury and Reading festivals. As a performer he’s appeared on almost every panel show around from Celebrity Juice to Never Mind the Buzzcocks to 8 Out of 10 Cats. He’s displayed his improv skills on Thank God You're Here and Argumental, and his serious side on Young Voters' Question Time and The Science of Doctor Who. He’s given his opinions on The Xtra Factor and The Apprentice: You’re Fired, and famously won Let's Dance for Sport Relief with his Cheryl Cole impression. He was also the star and writer of his own CBBC sitcom, Hounded. Away from the cameras Rufus has carved a successful stage career with a host of dramatic, comedy and musical theatre roles. He took the lead role in the critically acclaimed and hugely popular One Man, Two Guvnors in the West End and on tour. He followed this with more critical praise co-starring alongside Robert Lindsay in the London debut of the musical version of Dirty Rotten Scoundrels. He also appeared in Trevor Nunn’s production of The Wars of the Roses, and the RSC’s adaptation of Don Quixote.